Noah Adelman is the owner, CEO, and lead designer of Game Trayz. Noah started Game Trayz with a simple mission, to make the best custom inserts for your favorite games. Noah designs and manufactures high-quality vacuum formed trayz that provide creative and useful storage solutions for games. 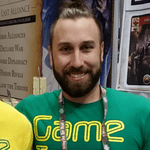 Noah started out by designing trayz for board games post-production but recently, he has started collaborating with game designers and companies to include Game Trayz in the original production of games. Mechs vs. Minions, the tabletop game from Riot games, was the first design included in all copies of the game. Followed by Wasteland Express published by Pandasauraus Games. He now has Trayz in over 20 games including Eclipse, The Grimm Forest, The Reckoners, Sweet Mess, Fireball Island, Agents of Mayhem, Dice Throne, and more. Noah looks forward to expanding his business by continuing to create one-of-a-kind products for the board game community, revolutionizing the way board games are stored and played. He lives in St. Louis, Missouri with the love of his life, Nicole, and their 2 pet pigs, Francine and Stella.